We have a very special sheep this week, the North Ronaldsay. Imagine it's 1832, and the North Ronaldsay flock have been happily grazing on their most northerly Scottish Isle for nearly 5000 years. They are quite small sheep, with fine bone structure, little faces, and big horns. The owner of the Isle, which was only 5km wide, thought his garden was beginning to look a bit barren, and pointed a finger at the sheep, who were happily eating everything. There was a danger of the greenery dying out, so he built a wall around the whole island and the the sheep were banished to the beach. They didn't mind eating seaweed, but their digestive systems had to adapt to extract the sugars more efficiently. They also had to change their dinner time. 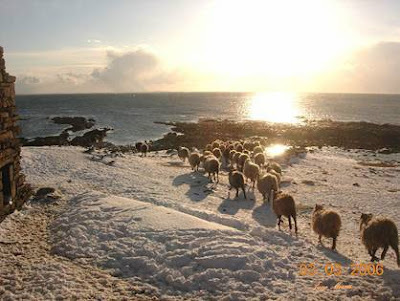 Most sheep graze during the day and sleep at night, but the North Ronaldsay's had to eat with the tides, getting up in the night when the tide was low, and sleeping when the tide was up. When they get thirsty they drink from a few fresh water pools along the shore. North Ronaldsays are now happy living on the beach, but would probably get sick if they went back to a copper based diet, and ate grass. This makes them very unique, and rarely seen outside their 'natural' habitat. They come in many colours and their wool is lovely for knitting. I'm off to Orkney in a couple of weeks, when I shall try and find some fleece.